Before the Cambrian explosion,[note 2] most organisms were simple, composed of individual cells occasionally organized into colonies. As the rate of diversification subsequently accelerated, the variety of life began to resemble that of today. Almost all present animal phyla appeared during this period. The seemingly rapid appearance of fossils in the "Primordial Strata" was noted by William Buckland in the 1840s, and in his 1859 book On the Origin of Species, Charles Darwin discussed the then inexplicable lack of earlier fossils as one of the main difficulties for his theory of descent with slow modification through natural selection. The long-running puzzlement about the appearance of the Cambrian fauna, seemingly abruptly, without precursor, centers on three key points: whether there really was a mass diversification of complex organisms over a relatively short period of time during the early Cambrian; what might have caused such rapid change; and what it would imply about the origin of animal life. Interpretation is difficult due to a limited supply of evidence, based mainly on an incomplete fossil record and chemical signatures remaining in Cambrian rocks. To the question why we do not find rich fossiliferous deposits belonging to these assumed earliest periods prior to the Cambrian system, I can give no satisfactory answer. 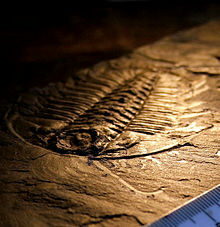 American paleontologist Charles Walcott, who studied the Burgess Shale fauna, proposed that an interval of time, the "Lipalian", was not represented in the fossil record or did not preserve fossils, and that the ancestors of the Cambrian animals evolved during this time. Earlier fossil evidence has since been found. The earliest claim is that the history of life on earth goes back 3,850 million years: Rocks of that age at Warrawoona, Australia, were claimed to contain fossil stromatolites, stubby pillars formed by colonies of microorganisms. Fossils (Grypania) of more complex eukaryotic cells, from which all animals, plants, and fungi are built, have been found in rocks from 1,400 million years ago, in China and Montana. Rocks dating from 580 to 543 million years ago contain fossils of the Ediacara biota, organisms so large that they are likely multicelled, but very unlike any modern organism. In 1948, Preston Cloud argued that a period of "eruptive" evolution occurred in the Early Cambrian, but as recently as the 1970s, no sign was seen of how the 'relatively' modern-looking organisms of the Middle and Late Cambrian arose. Opabinia made the largest single contribution to modern interest in the Cambrian explosion. The intense modern interest in this "Cambrian explosion" was sparked by the work of Harry B. Whittington and colleagues, who, in the 1970s, reanalysed many fossils from the Burgess Shale and concluded that several were as complex as, but different from, any living animals. The most common organism, Marrella, was clearly an arthropod, but not a member of any known arthropod class. Organisms such as the five-eyed Opabinia and spiny slug-like Wiwaxia were so different from anything else known that Whittington's team assumed they must represent different phyla, seemingly unrelated to anything known today. Stephen Jay Gould's popular 1989 account of this work, Wonderful Life, brought the matter into the public eye and raised questions about what the explosion represented. While differing significantly in details, both Whittington and Gould proposed that all modern animal phyla had appeared almost simultaneously in a rather short span of geological period. This view led to the modernization of Darwin's tree of life and the theory of punctuated equilibrium, which Eldredge and Gould developed in the early 1970s and which views evolution as long intervals of near-stasis "punctuated" by short periods of rapid change. Other analyses, some more recent and some dating back to the 1970s, argue that complex animals similar to modern types evolved well before the start of the Cambrian. Radiometric dates for much of the Cambrian, obtained by analysis of radioactive elements contained within rocks, have only recently become available, and for only a few regions. Relative dating (A was before B) is often assumed sufficient for studying processes of evolution, but this, too, has been difficult, because of the problems involved in matching up rocks of the same age across different continents. Therefore, dates or descriptions of sequences of events should be regarded with some caution until better data becomes available. Fossils of organisms' bodies are usually the most informative type of evidence. Fossilization is a rare event, and most fossils are destroyed by erosion or metamorphism before they can be observed. Hence, the fossil record is very incomplete, increasingly so as earlier times are considered. Despite this, they are often adequate to illustrate the broader patterns of life's history. Also, biases exist in the fossil record: different environments are more favourable to the preservation of different types of organism or parts of organisms. Further, only the parts of organisms that were already mineralised are usually preserved, such as the shells of molluscs. Since most animal species are soft-bodied, they decay before they can become fossilised. As a result, although 30-plus phyla of living animals are known, two-thirds have never been found as fossils. The Cambrian fossil record includes an unusually high number of lagerstätten, which preserve soft tissues. These allow paleontologists to examine the internal anatomy of animals, which in other sediments are only represented by shells, spines, claws, etc. – if they are preserved at all. The most significant Cambrian lagerstätten are the early Cambrian Maotianshan shale beds of Chengjiang (Yunnan, China) and Sirius Passet (Greenland); the middle Cambrian Burgess Shale (British Columbia, Canada); and the late Cambrian Orsten (Sweden) fossil beds. While lagerstätten preserve far more than the conventional fossil record, they are far from complete. Because lagerstätten are restricted to a narrow range of environments (where soft-bodied organisms can be preserved very quickly, e.g. by mudslides), most animals are probably not represented; further, the exceptional conditions that create lagerstätten probably do not represent normal living conditions. In addition, the known Cambrian lagerstätten are rare and difficult to date, while Precambrian lagerstätten have yet to be studied in detail. The sparseness of the fossil record means that organisms usually exist long before they are found in the fossil record – this is known as the Signor–Lipps effect. In 2019, a "stunning" find of lagerstätten, known as the Qingjiang biota, was reported from the Danshui river in Hubei province, China. More than 20,000 fossil specimens were collected, including many soft bodied animals such as jellyfish, sea anemones and worms, as well as sponges, arthropods and algae. In some specimens the internal body structures were sufficiently preserved that soft tissues, including muscles, gills, mouths, guts, gills and eyes, can be seen. The remains were dated to around 518 Mya and around half of the species identified at the time of reporting were previously unknown. Trace fossils consist mainly of tracks and burrows, but also include coprolites (fossil feces) and marks left by feeding. Trace fossils are particularly significant because they represent a data source that is not limited to animals with easily fossilized hard parts, and reflects organisms' behaviour. Also, many traces date from significantly earlier than the body fossils of animals that are thought to have been capable of making them. 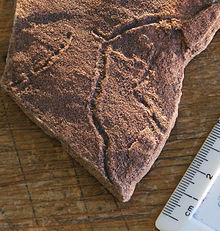 While exact assignment of trace fossils to their makers is generally impossible, traces may, for example, provide the earliest physical evidence of the appearance of moderately complex animals (comparable to earthworms). Several chemical markers indicate a drastic change in the environment around the start of the Cambrian. The markers are consistent with a mass extinction, or with a massive warming resulting from the release of methane ice. Such changes may reflect a cause of the Cambrian explosion, although they may also have resulted from an increased level of biological activity – a possible result of the explosion. Despite these uncertainties, the geochemical evidence helps by making scientists focus on theories that are consistent with at least one of the likely environmental changes. Cladistics is a technique for working out the "family tree" of a set of organisms. It works by the logic that, if groups B and C have more similarities to each other than either has to group A, then B and C are more closely related to each other than either is to A. Characteristics that are compared may be anatomical, such as the presence of a notochord, or molecular, by comparing sequences of DNA or protein. The result of a successful analysis is a hierarchy of clades – groups whose members are believed to share a common ancestor. The cladistic technique is sometimes problematic, as some features, such as wings or camera eyes, evolved more than once, convergently – this must be taken into account in analyses. From the relationships, it may be possible to constrain the date that lineages first appeared. For instance, if fossils of B or C date to X million years ago and the calculated "family tree" says A was an ancestor of B and C, then A must have evolved more than X million years ago. It is also possible to estimate how long ago two living clades diverged – i.e. about how long ago their last common ancestor must have lived – by assuming that DNA mutations accumulate at a constant rate. These "molecular clocks", however, are fallible, and provide only a very approximate timing: they are not sufficiently precise and reliable for estimating when the groups that feature in the Cambrian explosion first evolved, and estimates produced by different techniques vary by a factor of two. However, the clocks can give an indication of branching rate, and when combined with the constraints of the fossil record, recent clocks suggest a sustained period of diversification through the Ediacaran and Cambrian. A phylum is the highest level in the Linnaean system for classifying organisms. Phyla can be thought of as groupings of animals based on general body plan. Despite the seemingly different external appearances of organisms, they are classified into phyla based on their internal and developmental organizations. For example, despite their obvious differences, spiders and barnacles both belong to the phylum Arthropoda, but earthworms and tapeworms, although similar in shape, belong to different phyla. As chemical and genetic testing becomes more accurate, previously hypothesised phyla are often entirely reworked. A phylum is not a fundamental division of nature, such as the difference between electrons and protons. It is simply a very high-level grouping in a classification system created to describe all currently living organisms. This system is imperfect, even for modern animals: different books quote different numbers of phyla, mainly because they disagree about the classification of a huge number of worm-like species. As it is based on living organisms, it accommodates extinct organisms poorly, if at all. The concept of stem groups was introduced to cover evolutionary "aunts" and "cousins" of living groups, and have been hypothesized based on this scientific theory. A crown group is a group of closely related living animals plus their last common ancestor plus all its descendants. A stem group is a set of offshoots from the lineage at a point earlier than the last common ancestor of the crown group; it is a relative concept, for example tardigrades are living animals that form a crown group in their own right, but Budd (1996) regarded them as also being a stem group relative to the arthropods. A coelomate animal is basically a set of concentric tubes, with a gap between the gut and the outer tubes. The term Triploblastic means consisting of three layers, which are formed in the embryo, quite early in the animal's development from a single-celled egg to a larva or juvenile form. The innermost layer forms the digestive tract (gut); the outermost forms skin; and the middle one forms muscles and all the internal organs except the digestive system. Most types of living animal are triploblastic – the best-known exceptions are Porifera (sponges) and Cnidaria (jellyfish, sea anemones, etc.). The bilaterians are animals that have right and left sides at some point in their life histories. This implies that they have top and bottom surfaces and, importantly, distinct front and back ends. All known bilaterian animals are triploblastic, and all known triploblastic animals are bilaterian. Living echinoderms (sea stars, sea urchins, sea cucumbers, etc.) 'look' radially symmetrical (like wheels) rather than bilaterian, but their larvae exhibit bilateral symmetry and some of the earliest echinoderms may have been bilaterally symmetrical. Porifera and Cnidaria are radially symmetrical, not bilaterian, and not triploblastic. The term Coelomate means having a body cavity (coelom) containing the internal organs. Most of the phyla featured in the debate about the Cambrian explosion[clarification needed] are coelomates: arthropods, annelid worms, molluscs, echinoderms, and chordates – the noncoelomate priapulids are an important exception. All known coelomate animals are triploblastic bilaterians, but some triploblastic bilaterian animals do not have a coelom – for example flatworms, whose organs are surrounded by unspecialized tissues. Phylogenetic analysis has been used to support the view that during the Cambrian explosion, metazoans (multi-celled animals) evolved monophyletically from a single common ancestor: flagellated colonial protists similar to modern choanoflagellates. Changes in the abundance and diversity of some types of fossil have been interpreted as evidence for "attacks" by animals or other organisms. 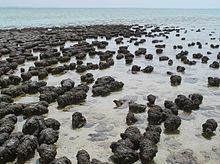 Stromatolites, stubby pillars built by colonies of microorganisms, are a major constituent of the fossil record from about 2,700 million years ago, but their abundance and diversity declined steeply after about 1,250 million years ago. This decline has been attributed to disruption by grazing and burrowing animals. Precambrian marine diversity was dominated by small fossils known as acritarchs. This term describes almost any small organic walled fossil – from the egg cases of small metazoans to resting cysts of many different kinds of green algae. After appearing around 2,000 million years ago, acritarchs underwent a boom around 1,000 million years ago, increasing in abundance, diversity, size, complexity of shape, and especially size and number of spines. Their increasingly spiny forms in the last 1 billion years may indicate an increased need for defence against predation. Other groups of small organisms from the Neoproterozoic era also show signs of antipredator defenses. A consideration of taxon longevity appears to support an increase in predation pressure around this time. In general, the fossil record shows a very slow appearance of these lifeforms in the Precambrian, with many cyanobacterial species making up much of the underlying sediment. The layers of the Doushantuo formation from around 580 million year old harbour microscopic fossils that may represent early bilaterians. Some have been described as animal embryos and eggs, although some may represent the remains of giant bacteria. Another fossil, Vernanimalcula, has been interpreted as a coelomate bilaterian, but may simply be an infilled bubble. These fossils form the earliest hard-and-fast evidence of animals, as opposed to other predators. The traces of organisms moving on and directly underneath the microbial mats that covered the Ediacaran sea floor are preserved from the Ediacaran period, about 565 million years ago. [note 3] They were probably made by organisms resembling earthworms in shape, size, and how they moved. The burrow-makers have never been found preserved, but, because they would need a head and a tail, the burrowers probably had bilateral symmetry – which would in all probability make them bilaterian animals. They fed above the sediment surface, but were forced to burrow to avoid predators. Around the start of the Cambrian (about 542 million years ago), many new types of traces first appear, including well-known vertical burrows such as Diplocraterion and Skolithos, and traces normally attributed to arthropods, such as Cruziana and Rusophycus. The vertical burrows indicate that worm-like animals acquired new behaviours, and possibly new physical capabilities. Some Cambrian trace fossils indicate that their makers possessed hard exoskeletons, although they were not necessarily mineralised. Burrows provide firm evidence of complex organisms; they are also much more readily preserved than body fossils, to the extent that the absence of trace fossils has been used to imply the genuine absence of large, motile, bottom-dwelling organisms. They provide a further line of evidence to show that the Cambrian explosion represents a real diversification, and is not a preservational artefact. This new habit changed the seafloor's geochemistry, and led to decreased oxygen in the ocean and increased CO2-levels in the seas and the atmosphere, resulting in global warming for tens of millions years, and could be responsible for mass extinctions. But as burrowing became established, it allowed an explosion of its own, for as burrowers disturbed the sea floor, they aerated it, mixing oxygen into the toxic muds. This made the bottom sediments more hospitable, and allowed a wider range of organisms to inhabit them – creating new niches and the scope for higher diversity. At the start of the Ediacaran period, much of the acritarch fauna, which had remained relatively unchanged for hundreds of millions of years, became extinct, to be replaced with a range of new, larger species, which would prove far more ephemeral. This radiation, the first in the fossil record, is followed soon after by an array of unfamiliar, large, fossils dubbed the Ediacara biota, which flourished for 40 million years until the start of the Cambrian. Most of this "Ediacara biota" were at least a few centimeters long, significantly larger than any earlier fossils. The organisms form three distinct assemblages, increasing in size and complexity as time progressed. Many of these organisms were quite unlike anything that appeared before or since, resembling discs, mud-filled bags, or quilted mattresses – one palæontologist proposed that the strangest organisms should be classified as a separate kingdom, Vendozoa. At least some may have been early forms of the phyla at the heart of the "Cambrian explosion" debate,[clarification needed] having been interpreted as early molluscs (Kimberella), echinoderms (Arkarua); and arthropods (Spriggina, Parvancorina). Still, debate exists about the classification of these specimens, mainly because the diagnostic features that allow taxonomists to classify more recent organisms, such as similarities to living organisms, are generally absent in the ediacarans. However, there seems little doubt that Kimberella was at least a triploblastic bilaterian animal. These organisms are central to the debate about how abrupt the Cambrian explosion was. If some were early members of the animal phyla seen today, the "explosion" looks a lot less sudden than if all these organisms represent an unrelated "experiment", and were replaced by the animal kingdom fairly soon thereafter (40M years is "soon" by evolutionary and geological standards). Paul Knauth, a geologist at Arizona State University, maintains that photosynthesizing organisms such as algae may have grown over a 750- to 800-million-year-old formation in Death Valley known as the Beck Spring Dolomite. In the early 1990s, samples from this 1,000-foot thick layer of dolomite revealed that the region housed flourishing mats of photosynthesizing, unicellular life forms which antedated the Cambrian explosion. Microfossils have been unearthed from holes riddling the otherwise barren surface of the dolomite. These geochemical and microfossil findings support the idea that during the Precambrian period, complex life evolved both in the oceans and on land. Knauth contends that animals may well have had their origins in freshwater lakes and streams, and not in the oceans. Some 30 years later, a number of studies have documented an abundance of geochemical and microfossil evidence showing that life covered the continents as far back as 2.2 billion years ago. Many paleobiologists now accept the idea that simple life forms existed on land during the Precambrian, but are opposed to the more radical idea that multicellular life thrived on land more than 600 million years ago. The first Ediacaran and lowest Cambrian (Nemakit-Daldynian) skeletal fossils represent tubes and problematic sponge spicules. The oldest sponge spicules are monaxon siliceous, aged around 580 million years ago, known from the Doushantou Formation in China and from deposits of the same age in Mongolia, although the interpretation of these fossils as spicules has been challenged. In the late Ediacaran-lowest Cambrian, numerous tube dwellings of enigmatic organisms appeared. It was organic-walled tubes (e.g. Saarina) and chitinous tubes of the sabelliditids (e.g. Sokoloviina, Sabellidites, Paleolina) that prospered up to the beginning of the Tommotian. The mineralized tubes of Cloudina, Namacalathus, Sinotubulites, and a dozen more of the other organisms from carbonate rocks formed near the end of the Ediacaran period from 549 to 542 million years ago, as well as the triradially symmetrical mineralized tubes of anabaritids (e.g. Anabarites, Cambrotubulus) from uppermost Ediacaran and lower Cambrian. Ediacaran mineralized tubes are often found in carbonates of the stromatolite reefs and thrombolites, i.e. they could live in an environment adverse to the majority of animals. Although they are as hard to classify as most other Ediacaran organisms, they are important in two other ways. First, they are the earliest known calcifying organisms (organisms that built shells from calcium carbonate). Secondly, these tubes are a device to rise over a substrate and competitors for effective feeding and, to a lesser degree, they serve as armor for protection against predators and adverse conditions of environment. Some Cloudina fossils show small holes in shells. The holes possibly are evidence of boring by predators sufficiently advanced to penetrate shells. A possible "evolutionary arms race" between predators and prey is one of the hypotheses that attempt to explain the Cambrian explosion. In the lowest Cambrian, the stromatolites were decimated. This allowed animals to begin colonization of warm-water pools with carbonate sedimentation. At first, it was anabaritids and Protohertzina (the fossilized grasping spines of chaetognaths) fossils. Such mineral skeletons as shells, sclerites, thorns, and plates appeared in uppermost Nemakit-Daldynian; they were the earliest species of halkierids, gastropods, hyoliths and other rare organisms. The beginning of the Tommotian has historically been understood to mark an explosive increase of the number and variety of fossils of molluscs, hyoliths, and sponges, along with a rich complex of skeletal elements of unknown animals, the first archaeocyathids, brachiopods, tommotiids, and others. Also soft-bodied extant phyla such as comb jellies, scalidophorans, entoproctans, horseshoe worms and lobopodians had armored forms. This sudden increase is partially an artefact of missing strata at the Tommotian type section, and most of this fauna in fact began to diversify in a series of pulses through the Nemakit-Daldynian and into the Tommotian. Some animals may already have had sclerites, thorns, and plates in the Ediacaran (e.g. 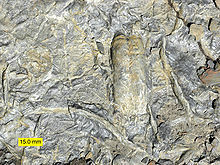 Kimberella had hard sclerites, probably of carbonate), but thin carbonate skeletons cannot be fossilized in siliciclastic deposits. Older (~750 Ma) fossils indicate that mineralization long preceded the Cambrian, probably defending small photosynthetic algae from single-celled eukaryotic predators. Trace fossils (burrows, etc.) are a reliable indicator of what life was around, and indicate a diversification of life around the start of the Cambrian, with the freshwater realm colonized by animals almost as quickly as the oceans. Fossils known as "small shelly fauna" have been found in many parts on the world, and date from just before the Cambrian to about 10 million years after the start of the Cambrian (the Nemakit-Daldynian and Tommotian ages; see timeline). These are a very mixed collection of fossils: spines, sclerites (armor plates), tubes, archeocyathids (sponge-like animals), and small shells very like those of brachiopods and snail-like molluscs – but all tiny, mostly 1 to 2 mm long. While small, these fossils are far more common than complete fossils of the organisms that produced them; crucially, they cover the window from the start of the Cambrian to the first lagerstätten: a period of time otherwise lacking in fossils. Hence, they supplement the conventional fossil record and allow the fossil ranges of many groups to be extended. A fossilized trilobite, an ancient type of arthropod: This specimen, from the Burgess Shale, preserves "soft parts" – the antennae and legs. The earliest trilobite fossils are about 530 million years old, but the class was already quite diverse and worldwide, suggesting they had been around for quite some time. The fossil record of trilobites began with the appearance of trilobites with mineral exoskeletons – not from the time of their origin. The earliest generally accepted echinoderm fossils appeared a little bit later, in the Late Atdabanian; unlike modern echinoderms, these early Cambrian echinoderms were not all radially symmetrical. These provide firm data points for the "end" of the explosion, or at least indications that the crown groups of modern phyla were represented. 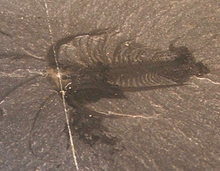 The Burgess Shale and similar lagerstätten preserve the soft parts of organisms, which provide a wealth of data to aid in the classification of enigmatic fossils. It often preserved complete specimens of organisms only otherwise known from dispersed parts, such as loose scales or isolated mouthparts. Further, the majority of organisms and taxa in these horizons are entirely soft-bodied, hence absent from the rest of the fossil record. Since a large part of the ecosystem is preserved, the ecology of the community can also be tentatively reconstructed. [verification needed] However, the assemblages may represent a "museum": a deep-water ecosystem that is evolutionarily "behind" the rapidly diversifying fauna of shallower waters. Because the lagerstätten provide a mode and quality of preservation that is virtually absent outside of the Cambrian, many organisms appear completely different from anything known from the conventional fossil record. This led early workers in the field to attempt to shoehorn the organisms into extant phyla; the shortcomings of this approach led later workers to erect a multitude of new phyla to accommodate all the oddballs. It has since been realised that most oddballs diverged from lineages before they established the phyla known today[clarification needed] – slightly different designs, which were fated to perish rather than flourish into phyla, as their cousin lineages did. The preservational mode is rare in the preceding Ediacaran period, but those assemblages known show no trace of animal life – perhaps implying a genuine absence of macroscopic metazoans. Crustaceans, one of the four great modern groups of arthropods, are very rare throughout the Cambrian. Convincing crustaceans were once thought to be common in Burgess Shale-type biotas, but none of these individuals can be shown to fall into the crown group of "true crustaceans". The Cambrian record of crown-group crustaceans comes from microfossils. The Swedish Orsten horizons contain later Cambrian crustaceans, but only organisms smaller than 2 mm are preserved. This restricts the data set to juveniles and miniaturised adults. A more informative data source is the organic microfossils of the Mount Cap formation, Mackenzie Mountains, Canada. This late Early Cambrian assemblage (510 to 515 million years ago) consists of microscopic fragments of arthropods' cuticle, which is left behind when the rock is dissolved with hydrofluoric acid. The diversity of this assemblage is similar to that of modern crustacean faunas. Analysis of fragments of feeding machinery found in the formation shows that it was adapted to feed in a very precise and refined fashion. This contrasts with most other early Cambrian arthropods, which fed messily by shovelling anything they could get their feeding appendages on into their mouths. This sophisticated and specialised feeding machinery belonged to a large (about 30 cm) organism, and would have provided great potential for diversification; specialised feeding apparatus allows a number of different approaches to feeding and development, and creates a number of different approaches to avoid being eaten. After an extinction at the Cambrian–Ordovician boundary, another radiation occurred, which established the taxa that would dominate the Palaeozoic. During this radiation, the total number of orders doubled, and families tripled, increasing marine diversity to levels typical of the Palaeozoic, and disparity to levels approximately equivalent to today's. The event lasted for about the next 20–25 million years, and its elevated rates of evolution had ended by the base of Cambrian Series 2, 521 million years ago, coincident with the first trilobites in the fossil record. Different authors break the explosion down into stages in different ways. Ed Landing recognizes three stages: Stage 1, spanning the Ediacaran-Cambrian boundary, corresponds to a diversification of biomineralizing animals and of deep and complex burrows; Stage 2, corresponding to the radiation of molluscs and stem-group Brachiopods (hyoliths and tommotiids), which apparently arose in intertidal waters; and Stage 3, seeing the Atdabanian diversification of trilobites in deeper waters, but little change in the intertidal realm. Graham Budd synthesises various schemes to produce a compatible view of the SSF record of the Cambrian explosion, divided slightly differently into four intervals: a "Tube world", lasting from 550 to 536 million years ago, spanning the Ediacaran-Cambrian boundary, dominated by Cloudina, Namacalathus and pseudoconodont-type elements; a "Sclerite world", seeing the rise of halkieriids, tommotiids, and hyoliths, lasting to the end of the Fortunian (c. 525 Ma); a brachiopod world, perhaps corresponding to the as yet unratified Cambrian Stage 2; and Trilobite World, kicking off in Stage 3. There is strong evidence for species of Cnidaria and Porifera existing in the Ediacaran and possible members of Porifera even before that during the Cryogenian. Bryozoans don't appear in the fossil record until after the Cambrian, in the Lower Ordovician. The fossil record as Darwin knew it seemed to suggest that the major metazoan groups appeared in a few million years of the early to mid-Cambrian, and even in the 1980s, this still appeared to be the case. However, evidence of Precambrian Metazoa is gradually accumulating. If the Ediacaran Kimberella was a mollusc-like protostome (one of the two main groups of coelomates), the protostome and deuterostome lineages must have split significantly before 550 million years ago (deuterostomes are the other main group of coelomates). Even if it is not a protostome, it is widely accepted as a bilaterian. Since fossils of rather modern-looking cnidarians (jellyfish-like organisms) have been found in the Doushantuo lagerstätte, the cnidarian and bilaterian lineages must have diverged well over 580 million years ago. Trace fossils and predatory borings in Cloudina shells provide further evidence of Ediacaran animals. Some fossils from the Doushantuo formation have been interpreted as embryos and one (Vernanimalcula) as a bilaterian coelomate, although these interpretations are not universally accepted. Earlier still, predatory pressure has acted on stromatolites and acritarchs since around 1,250 million years ago. Some say that the evolutionary change was accelerated by an order of magnitude,[note 4] but the presence of Precambrian animals somewhat dampens the "bang" of the explosion; not only was the appearance of animals gradual, but their evolutionary radiation ("diversification") may also not have been as rapid as once thought. Indeed, statistical analysis shows that the Cambrian explosion was no faster than any of the other radiations in animals' history. [note 5] However, it does seem that some innovations linked to the explosion – such as resistant armour – only evolved once in the animal lineage; this makes a lengthy Precambrian animal lineage harder to defend. Further, the conventional view that all the phyla arose in the Cambrian is flawed; while the phyla may have diversified in this time period, representatives of the crown groups of many phyla do not appear until much later in the Phanerozoic. Further, the mineralised phyla that form the basis of the fossil record may not be representative of other phyla, since most mineralised phyla originated in a benthic setting. The fossil record is consistent with a Cambrian explosion that was limited to the benthos, with pelagic phyla evolving much later. Ecological complexity among marine animals increased in the Cambrian, as well later in the Ordovician. However, recent research has overthrown the once-popular idea that disparity was exceptionally high throughout the Cambrian, before subsequently decreasing. In fact, disparity remains relatively low throughout the Cambrian, with modern levels of disparity only attained after the early Ordovician radiation. The diversity of many Cambrian assemblages is similar to today's, and at a high (class/phylum) level, diversity is thought by some to have risen relatively smoothly through the Cambrian, stabilizing somewhat in the Ordovician. This interpretation, however, glosses over the astonishing and fundamental pattern of basal polytomy and phylogenetic telescoping at or near the Cambrian boundary, as seen in most major animal lineages. Thus Harry Blackmore Whittington's questions regarding the abrupt nature of the Cambrian explosion remain, and have yet to be satisfactorily answered. Budd and Mann suggested that the Cambrian explosion was the result of a type of survivorship bias called the "Push of the past". As groups at their origin tend to go extinct, it follows that any long-lived group would have experienced an unusually rapid rate of diversification early on, creating the illusion of a general speed-up in diversification rates. However, rates of diversification could remain at background levels and still generate this sort of effect in the surviving lineages. Despite the evidence that moderately complex animals (triploblastic bilaterians) existed before and possibly long before the start of the Cambrian, it seems that the pace of evolution was exceptionally fast in the early Cambrian. Possible explanations for this fall into three broad categories: environmental, developmental, and ecological changes. Any explanation must explain both the timing and magnitude of the explosion. Earth's earliest atmosphere contained no free oxygen (O2); the oxygen that animals breathe today, both in the air and dissolved in water, is the product of billions of years of photosynthesis. Cyanobacteria were the first organisms to evolve the ability to photosynthesize, introducing a steady supply of oxygen into the environment. Initially, oxygen levels did not increase substantially in the atmosphere. The oxygen quickly reacted with iron and other minerals in the surrounding rock and ocean water. Once a saturation point was reached for the reactions in rock and water, oxygen was able to exist as a gas in its diatomic form. Oxygen levels in the atmosphere increased substantially afterward. As a general trend, the concentration of oxygen in the atmosphere has risen gradually over about the last 2.5 billion years. Oxygen levels seem to have a positive correlation with diversity in eukaryotes well before the Cambrian period. The last common ancestor of all extant eukaryotes is thought to have lived around 1.8 billion years ago. Around 800 million years ago, there was a notable increase in the complexity and number of eukaryotes species in the fossil record. Before the spike in diversity, eukaryotes are thought to have lived in highly sulfuric environments. Sulfide interferes with mitochondrial function in aerobic organisms, limiting the amount of oxygen that could be used to drive metabolism. Oceanic sulfide levels decreased around 800 million years ago, which supports the importance of oxygen in eukaryotic diversity. The shortage of oxygen might well have prevented the rise of large, complex animals. The amount of oxygen an animal can absorb is largely determined by the area of its oxygen-absorbing surfaces (lungs and gills in the most complex animals; the skin in less complex ones); but, the amount needed is determined by its volume, which grows faster than the oxygen-absorbing area if an animal's size increases equally in all directions. An increase in the concentration of oxygen in air or water would increase the size to which an organism could grow without its tissues becoming starved of oxygen. However, members of the Ediacara biota reached metres in length tens of millions of years before the Cambrian explosion. Other metabolic functions may have been inhibited by lack of oxygen, for example the construction of tissue such as collagen, required for the construction of complex structures, or to form molecules for the construction of a hard exoskeleton. However, animals are not affected when similar oceanographic conditions occur in the Phanerozoic; there is no convincing correlation between oxygen levels and evolution, so oxygen may have been no more a prerequisite to complex life than liquid water or primary productivity. The amount of ozone (O3) required to shield Earth from biologically lethal UV radiation, wavelengths from 200 to 300 nanometers (nm), is believed to have been in existence around the Cambrian explosion. The presence of the ozone layer may have enabled the development of complex life and life on land, as opposed to life being restricted to the water. In the late Neoproterozoic (extending into the early Ediacaran period), the Earth suffered massive glaciations in which most of its surface was covered by ice. This may have caused a mass extinction, creating a genetic bottleneck; the resulting diversification may have given rise to the Ediacara biota, which appears soon after the last "Snowball Earth" episode. However, the snowball episodes occurred a long time before the start of the Cambrian, and it is hard to see how so much diversity could have been caused by even a series of bottlenecks; the cold periods may even have delayed the evolution of large size organisms. Newer research suggests that volcanically active midocean ridges caused a massive and sudden surge of the calcium concentration in the oceans, making it possible for marine organisms to build skeletons and hard body parts. Alternatively a high influx of ions could have been provided by the widespread erosion that produced Powell's Great Unconformity. An increase of calcium may also have been caused by erosion of the Transgondwanan Supermountain that existed at the time of the explosion. The roots of the mountain are preserved in present-day East Africa as an orogen. A range of theories are based on the concept that minor modifications to animals' development as they grow from embryo to adult may have been able to cause very large changes in the final adult form. The Hox genes, for example, control which organs individual regions of an embryo will develop into. For instance, if a certain Hox gene is expressed, a region will develop into a limb; if a different Hox gene is expressed in that region (a minor change), it could develop into an eye instead (a phenotypically major change). Such a system allows a large range of disparity to appear from a limited set of genes, but such theories linking this with the explosion struggle to explain why the origin of such a development system should by itself lead to increased diversity or disparity. Evidence of Precambrian metazoans combines with molecular data to show that much of the genetic architecture that could feasibly have played a role in the explosion was already well established by the Cambrian. This apparent paradox is addressed in a theory that focuses on the physics of development. It is proposed that the emergence of simple multicellular forms provided a changed context and spatial scale in which novel physical processes and effects were mobilized by the products of genes that had previously evolved to serve unicellular functions. Morphological complexity (layers, segments, lumens, appendages) arose, in this view, by self-organization. Horizontal gene transfer has also been identified as a possible factor in the rapid acquisition of the biochemical capability of biomineralization among organisms during this period, based on evidence that the gene for a critical protein in the process was originally transferred from a bacterium into sponges. These focus on the interactions between different types of organism. Some of these hypotheses deal with changes in the food chain; some suggest arms races between predators and prey, and others focus on the more general mechanisms of coevolution. Such theories are well suited to explaining why there was a rapid increase in both disparity and diversity, but they must explain why the "explosion" happened when it did. Evidence for such an extinction includes the disappearance from the fossil record of the Ediacara biota and shelly fossils such as Cloudina, and the accompanying perturbation in the δ13C record. Mass extinctions are often followed by adaptive radiations as existing clades expand to occupy the ecospace emptied by the extinction. However, once the dust had settled, overall disparity and diversity returned to the pre-extinction level in each of the Phanerozoic extinctions. Andrew Parker has proposed that predator-prey relationships changed dramatically after eyesight evolved. Prior to that time, hunting and evading were both close-range affairs – smell, vibration, and touch were the only senses used. When predators could see their prey from a distance, new defensive strategies were needed. Armor, spines, and similar defenses may also have evolved in response to vision. He further observed that, where animals lose vision in unlighted environments such as caves, diversity of animal forms tends to decrease. Nevertheless, many scientists doubt that vision could have caused the explosion. Eyes may well have evolved long before the start of the Cambrian. It is also difficult to understand why the evolution of eyesight would have caused an explosion, since other senses, such as smell and pressure detection, can detect things at a greater distance in the sea than sight can; but the appearance of these other senses apparently did not cause an evolutionary explosion. The ability to avoid or recover from predation often makes the difference between life and death, and is therefore one of the strongest components of natural selection. The pressure to adapt is stronger on the prey than on the predator: if the predator fails to win a contest, it loses a meal; if the prey is the loser, it loses its life. But, there is evidence that predation was rife long before the start of the Cambrian, for example in the increasingly spiny forms of acritarchs, the holes drilled in Cloudina shells, and traces of burrowing to avoid predators. Hence, it is unlikely that the appearance of predation was the trigger for the Cambrian "explosion", although it may well have exhibited a strong influence on the body forms that the "explosion" produced. However, the intensity of predation does appear to have increased dramatically during the Cambrian as new predatory "tactics" (such as shell-crushing) emerged. This rise of predation during the Cambrian was confirmed by the temporal pattern of the median predator ratio at the scale of genus, in fossil communities covering the Cambrian and Ordovician periods, but this pattern is not correlated to diversification rate. This lack of correlation between predator ratio and diversification over the Cambrian and Ordovician suggests that predators did not trigger the large evolutionary radiation of animals during this interval. Thus the role of predators as triggerers of diversification may have been limited to the very beginning of the "Cambrian explosion". Geochemical evidence strongly indicates that the total mass of plankton has been similar to modern levels since early in the Proterozoic. 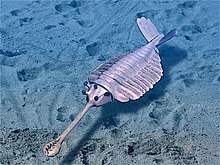 Before the start of the Cambrian, their corpses and droppings were too small to fall quickly towards the seabed, since their drag was about the same as their weight. This meant they were destroyed by scavengers or by chemical processes before they reached the sea floor. Mesozooplankton are plankton of a larger size. Early Cambrian specimens filtered microscopic plankton from the seawater. These larger organisms would have produced droppings and corpses that were large enough to fall fairly quickly. This provided a new supply of energy and nutrients to the mid-levels and bottoms of the seas, which opened up a huge range of new possible ways of life. If any of these remains sank uneaten to the sea floor they could be buried; this would have taken some carbon out of circulation, resulting in an increase in the concentration of breathable oxygen in the seas (carbon readily combines with oxygen). The initial herbivorous mesozooplankton were probably larvae of benthic (seafloor) animals. A larval stage was probably an evolutionary innovation driven by the increasing level of predation at the seafloor during the Ediacaran period. Metazoans have an amazing ability to increase diversity through coevolution. This means that an organism's traits can lead to traits evolving in other organisms; a number of responses are possible, and a different species can potentially emerge from each one. As a simple example, the evolution of predation may have caused one organism to develop a defence, while another developed motion to flee. This would cause the predator lineage to split into two species: one that was good at chasing prey, and another that was good at breaking through defences. Actual coevolution is somewhat more subtle, but, in this fashion, great diversity can arise: three quarters of living species are animals, and most of the rest have formed by coevolution with animals. Evolving organisms inevitably change the environment they evolve in. The Devonian colonization of land had planet-wide consequences for sediment cycling and ocean nutrients, and was likely linked to the Devonian mass extinction. A similar process may have occurred on smaller scales in the oceans, with, for example, the sponges filtering particles from the water and depositing them in the mud in a more digestible form; or burrowing organisms making previously unavailable resources available for other organisms. The explosion may not have been a significant evolutionary event. It may represent a threshold being crossed: for example a threshold in genetic complexity that allowed a vast range of morphological forms to be employed. This genetic threshold may have a correlation to the amount of oxygen available to organisms. Using oxygen for metabolism produces much more energy than anaerobic processes. Organisms that use more oxygen have the opportunity to produce more complex proteins, providing a template for further evolution. These proteins translate into larger, more complex structures that allow organisms better to adapt to their environments. With the help of oxygen, genes that code for these proteins could contribute to the expression of complex traits more efficiently. Access to a wider range of structures and functions would allow organisms to evolve in different directions, increasing the number of niches that could be inhabited. Furthermore, organisms had the opportunity to become more specialized in their own niches. The "Cambrian explosion" can be viewed as two waves of metazoan expansion into empty niches: first, a coevolutionary rise in diversity as animals explored niches on the Ediacaran sea floor, followed by a second expansion in the early Cambrian as they became established in the water column. The rate of diversification seen in the Cambrian phase of the explosion is unparalleled among marine animals: it affected all metazoan clades of which Cambrian fossils have been found. Later radiations, such as those of fish in the Silurian and Devonian periods, involved fewer taxa, mainly with very similar body plans. Although the recovery from the Permian-Triassic extinction started with about as few animal species as the Cambrian explosion, the recovery produced far fewer significantly new types of animals. Whatever triggered the early Cambrian diversification opened up an exceptionally wide range of previously unavailable ecological niches. When these were all occupied, limited space existed for such wide-ranging diversifications to occur again, because strong competition existed in all niches and incumbents usually had the advantage. If a wide range of empty niches had continued, clades would be able to continue diversifying and become disparate enough for us to recognise them as different phyla; when niches are filled, lineages will continue to resemble one another long after they diverge, as limited opportunity exists for them to change their life-styles and forms. There were two similar explosions in the evolution of land plants: after a cryptic history beginning about 450 million years ago, land plants underwent a uniquely rapid adaptive radiation during the Devonian period, about 400 million years ago. Furthermore, Angiosperms (flowering plants) originated and rapidly diversified during the Cretaceous period. ^ This included at least animals, phytoplankton and calcimicrobes. ^ At 610 million years ago, Aspidella disks appeared, but it is not clear that these represented complex life forms. ^ Older marks found in billion-year-old rocks have since been recognised as nonbiogenic. ^ As defined in terms of the extinction and origination rate of species. ^ The analysis considered the bioprovinciality of trilobite lineages, as well as their evolutionary rate. ^ Zhuravlev, Andrey; Riding, Robert (2000). The Ecology of the Cambrian Radiation. Columbia University Press. ISBN 978-0-231-10613-9. The Cambrian radiation was the explosive evolution of marine life that started 550,000,000 years ago. It ranks as one of the most important episodes in Earth history. This key event in the history of life on our planet changed the marine biosphere and its sedimentary environment forever, requiring a complex interplay of wide-ranging biologic and nonbiologic processes. ^ Maloof, A. C.; Porter, S. M.; Moore, J. L.; Dudas, F. O.; Bowring, S. A.; Higgins, J. A.; Fike, D. A.; Eddy, M. P. (2010). "The earliest Cambrian record of animals and ocean geochemical change". Geological Society of America Bulletin. 122 (11–12): 1731–1774. Bibcode:2010GSAB..122.1731M. doi:10.1130/B30346.1. ^ a b Valentine, JW; Jablonski, D; Erwin, DH (1999). "Fossils, molecules and embryos: new perspectives on the Cambrian explosion". Development. 126 (5): 851–9. PMID 9927587. ^ Budd, Graham (2013). "At the origin of animals: the revolutionary cambrian fossil record". Current Genomics. 14 (6): 344–354. doi:10.2174/13892029113149990011. PMC 3861885. PMID 24396267. ^ Erwin, D. H.; Laflamme, M.; Tweedt, S. M.; Sperling, E. A.; Pisani, D.; Peterson, K. J. (2011). "The Cambrian conundrum: early divergence and later ecological success in the early history of animals". Science. 334 (6059): 1091–1097. Bibcode:2011Sci...334.1091E. doi:10.1126/science.1206375. PMID 22116879. ^ Kouchinsky, A.; Bengtson, S.; Runnegar, B. N.; Skovsted, C. B.; Steiner, M.; Vendrasco, M. J. (2012). "Chronology of early Cambrian biomineralization". Geological Magazine. 149 (2): 221–251. Bibcode:2012GeoM..149..221K. doi:10.1017/s0016756811000720. ^ Conway Morris, S. (2003). "The Cambrian "explosion" of metazoans and molecular biology: would Darwin be satisfied?". The International Journal of Developmental Biology. 47 (7–8): 505–15. PMID 14756326. ^ a b Butterfield, N.J. (2001). "Ecology and evolution of Cambrian plankton" (PDF). The Ecology of the Cambrian Radiation. New York: Columbia University Press. pp. 200–216. ISBN 978-0-231-10613-9. Retrieved 2007-08-19. ^ a b c d Bambach, R.K.; Bush, A.M.; Erwin, D.H. (2007). "Autecology and the filling of Ecospace: Key metazoan radiations". Palæontology. 50 (1): 1–22. doi:10.1111/j.1475-4983.2006.00611.x. ^ a b c d Budd, G. E.; Jensen, S. (2000). "A critical reappraisal of the fossil record of the bilaterian phyla". Biological Reviews of the Cambridge Philosophical Society. 75 (2): 253–95. doi:10.1111/j.1469-185X.1999.tb00046.x. PMID 10881389. ^ Budd, G.E. (2003). "The Cambrian Fossil Record and the Origin of the Phyla". Integrative and Comparative Biology. 43 (1): 157–165. doi:10.1093/icb/43.1.157. PMID 21680420. ^ a b Buckland, W. (1841). Geology and Mineralogy Considered with Reference to Natural Theology. Lea & Blanchard. ISBN 978-1-147-86894-4. ^ a b Darwin, C (1859). On the Origin of Species by Natural Selection. London: Murray. pp. 202, 306–308. ISBN 978-1-60206-144-6. OCLC 176630493. ^ Liñán, E.; Gonzalo, R (2008). "Cryptopalaeontology: Magical descriptions of trilobites about two thousand years before scientific references". In Rábano, I.; Gozalo, R.; García-Bellido, D. (eds.). Advances in Trilobite Research. Madrid: Instituto Geológico y Minero de España. p. 240. ISBN 978-84-7840-759-0. ^ Bell, Mark (2013). "Fossil Focus: Trilobites". Palaeontology Online. 3 (5): 1–9. ^ Darwin, Charles R. (1876). The origin of Species by Means of Natural Selection (6 ed.). p. 286. ^ Walcott, C.D. (1914). "Cambrian Geology and Paleontology". Smithsonian Miscellaneous Collections. 57: 14. ^ Holland, Heinrich D (January 3, 1997). "Evidence for life on earth more than 3850 million years ago". Science. 275 (5296): 38–9. doi:10.1126/science.275.5296.38. PMID 11536783. ^ a b c d e f g Cowen, R. (2002). History of Life. Blackwell Science. ISBN 978-1-4051-1756-2. ^ Cloud, P.E. (1948). "Some problems and patterns of evolution exemplified by fossil invertebrates". Evolution. 2 (4): 322–350. doi:10.2307/2405523. JSTOR 2405523. PMID 18122310. ^ Whittington, H. B. (1979). Early arthropods, their appendages and relationships. In M. R. House (Ed. ), The origin of major invertebrate groups (pp. 253–268). The Systematics Association Special Volume, 12. London: Academic Press. ^ a b Whittington, H.B. ; Geological Survey of Canada (1985). The Burgess Shale. Yale University Press. ISBN 978-0-660-11901-4. OCLC 15630217. ^ a b Gould, S.J. (1989). Wonderful Life: The Burgess Shale and the Nature of History. W. W. Norton & Company. ISBN 978-0-393-02705-1. OCLC 185746546. ^ Bengtson, S. (2004). "Early skeletal fossils" (PDF). In Lipps, J.H. ; Waggoner, B.M. (eds.). Neoproterozoic-Cambrian Biological Revolutions. The Paleontological Society Papers. 10. pp. 67–78. ^ a b McNamara, K.J. (20 December 1996). "Dating the Origin of Animals". Science. 274 (5295): 1993–1997. Bibcode:1996Sci...274.1993M. doi:10.1126/science.274.5295.1993f. Retrieved 2008-06-28. ^ a b Awramik, S.M. (19 November 1971). "Precambrian columnar stromatolite diversity: Reflection of metazoan appearance". Science (abstract). 174 (4011): 825–827. Bibcode:1971Sci...174..825A. doi:10.1126/science.174.4011.825. PMID 17759393. ^ a b c Fedonkin, M. A.; Waggoner, B. M. (November 1997). "The late Precambrian fossil Kimberella is a mollusc-like bilaterian organism". Nature (abstract). 388 (6645): 868–871. Bibcode:1997Natur.388..868F. doi:10.1038/42242. ISSN 0372-9311. ^ e.g. Gehling, James; Jensen, Sören; Droser, Mary; Myrow, Paul; Narbonne, Guy (March 2001). "Burrowing below the basal Cambrian GSSP, Fortune Head, Newfoundland". Geological Magazine. 138 (2): 213–218. Bibcode:2001GeoM..138..213G. doi:10.1017/S001675680100509X. ^ Butterfield, N.J. (2003). "Exceptional Fossil Preservation and the Cambrian Explosion". Integrative and Comparative Biology. 43 (1): 166–177. doi:10.1093/icb/43.1.166. PMID 21680421. Retrieved 2008-06-28. ^ Morris, S.C. (1979). "The Burgess Shale (Middle Cambrian) Fauna". Annual Review of Ecology and Systematics. 10 (1): 327–349. doi:10.1146/annurev.es.10.110179.001551. ^ Yochelson, E.L. (1996). "Discovery, Collection, and Description of the Middle Cambrian Burgess Shale Biota by Charles Doolittle Walcott" [2017-01-11]. Proceedings of the American Philosophical Society. 140 (4): 469–545. JSTOR 987289. ^ a b c Butterfield, N.J. (2001). Ecology and evolution of Cambrian plankton. The Ecology of the Cambrian Radiation. Columbia University Press, New York. pp. 200–216. ISBN 978-0-231-10613-9. Retrieved 2007-08-19. ^ Signor, P.W. ; Lipps, J.H. (1982). "Sampling bias, gradual extinction patterns and catastrophes in the fossil record". In Silver, L.T. ; Schulz, P.H. (eds.). Geological implications of impacts of large asteroids and comets on the earth. Geological Society of America. pp. 291–296. ISBN 978-0813721903. A 84–25651 10–42. ^ "Huge fossil discovery made in China's Hubei province". BBC News. Retrieved 24 March 2019. ^ "'Mindblowing' haul of fossils over 500m years old unearthed in China". The Guardian. Retrieved 24 March 2019. ^ Fu, Dongjing; Tong, Guanghui; Dai, Tao M.; Liu, Wei; Yang, Yuning; Zhang, Yuan; Cui, Linhao; Li, Lyoyang; Yun, Hao; Wu, Yu; Sun, Ao; Liu, Cong; Pei, Wenrui; Gaines, Robert R.; Zhang, Xingliang (2019). "The Qingjiang biota—A Burgess Shale–type fossil Lagerstätte from the early Cambrian of South China". Science. 363 (6433): 1338–1342. doi:10.1126/science.aau8800. PMID 30898931. ^ "What is paleontology?". University of California Museum of Paleontology. Retrieved 2008-09-18. ^ a b Fedonkin, M.A. ; Gehling, J.G. ; Grey, K.; Narbonne, G.M. ; Vickers-Rich, P. (2007). The Rise of Animals: Evolution and Diversification of the Kingdom Animalia. JHU Press. pp. 213–216. ISBN 978-0-8018-8679-9. Retrieved 2008-11-14. ^ e.g. Seilacher, A. (1994). "How valid is Cruziana Stratigraphy?". International Journal of Earth Sciences. 83 (4): 752–758. Bibcode:1994GeoRu..83..752S. doi:10.1007/BF00251073. ^ a b e.g. Knoll, A.H.; Carroll, S.B. (1999-06-25). "Early Animal Evolution: Emerging Views from Comparative Biology and Geology". Science. 284 (5423): 2129–37. doi:10.1126/science.284.5423.2129. PMID 10381872. ^ Amthor, J.E. ; Grotzinger, J.P.; Schroder, S.; Bowring, S.A.; Ramezani, J.; Martin, M.W. ; Matter, A. (2003). "Extinction of Cloudina and Namacalathus at the Precambrian-Cambrian boundary in Oman". Geology. 31 (5): 431–434. Bibcode:2003Geo....31..431A. doi:10.1130/0091-7613(2003)031<0431:EOCANA>2.0.CO;2. ISSN 0091-7613. ^ a b c d e f g h Marshall, C. R. (2006). "Explaining the Cambrian "Explosion" of Animals". Annu. Rev. Earth Planet. Sci. (abstract). 34: 355–384. Bibcode:2006AREPS..34..355M. doi:10.1146/annurev.earth.33.031504.103001. ^ Hug, L.A.; Roger, A.J. (August 2007). "The Impact of Fossils and Taxon Sampling on Ancient Molecular Dating Analyses" (Free full text). Molecular Biology and Evolution. 24 (8): 889–1897. doi:10.1093/molbev/msm115. ISSN 0737-4038. PMID 17556757. ^ Peterson, Kevin J.; Butterfield, N.J. (2005). "Origin of the Eumetazoa: Testing ecological predictions of molecular clocks against the Proterozoic fossil record". Proceedings of the National Academy of Sciences. 102 (27): 9547–9552. Bibcode:2005PNAS..102.9547P. doi:10.1073/pnas.0503660102. PMC 1172262. PMID 15983372. ^ Peterson, Kevin J.; Cotton, JA; Gehling, JG; Pisani, D (April 2008). "The Ediacaran emergence of bilaterians: congruence between the genetic and the geological fossil records". Philosophical Transactions of the Royal Society B: Biological Sciences. 363 (1496): 1435–1443. doi:10.1098/rstb.2007.2233. ISSN 0962-8436. PMC 2614224. PMID 18192191. ^ a b Craske, A.J. ; Jefferies, R.P.S. (1989). "A new mitrate from the Upper Ordovician of Norway, and a new approach to subdividing a plesion" (PDF). Palaeontology. 32: 69–99. Archived from the original (PDF) on 2011-08-24. Retrieved 2010-12-25. ^ Valentine, James W. (2004). On the Origin of Phyla. Chicago: University Of Chicago Press. p. 7. ISBN 978-0-226-84548-7. " Classifications of organisms in hierarchical systems were in use by the 17th and 18th centuries. Usually, organisms were grouped according to their morphological similarities as perceived by those early workers, and those groups were then grouped according to their similarities, and so on, to form a hierarchy. " ^ Parker, Andrew (2003). In the blink of an eye: How vision kick-started the big bang of evolution. Sydney: Free Press. pp. 1–4. ISBN 978-0-7432-5733-6. " Evolutionary biologists often make sense of the conflicting diversity of form – not always does a relationship between internal and external parts. Early in the history of the subject, it became obvious that internal organisations were generally more important to the higher classification of animals than are external shapes. The internal organisation puts general restrictions on how an animal can exchange gases, obtain nutrients, and reproduce. " ^ Jefferies, R.P.S. (1979). House, M.R. (ed.). The origin of chordates – a methodological essay. The origin of major invertebrate groups. London: Academic Press. pp. 443–477. summarised in Budd, G.E. (2003). "The Cambrian Fossil Record and the Origin of the Phyla". Integrative and Comparative Biology. 43 (1): 157–165. doi:10.1093/icb/43.1.157. PMID 21680420. ^ Budd, G.E. (1996). "The morphology of Opabinia regalis and the reconstruction of the arthropod stem-group". Lethaia. 29 (1): 1–14. doi:10.1111/j.1502-3931.1996.tb01831.x. ^ Dominguez, P.; Jacobson, A.G.; Jefferies, R.P.S. (June 2002). "Paired gill slits in a fossil with a calcite skeleton". Nature. 417 (6891): 841–844. Bibcode:2002Natur.417..841D. doi:10.1038/nature00805. ISSN 0028-0836. PMID 12075349. ^ a b c d e f Bengtson, S. (2002). "Origins and early evolution of predation". In Kowalewski, M.; Kelley, P.H. (eds.). The fossil record of predation. The Paleontological Society Papers 8 (Free full text). The Paleontological Society. pp. 289–317. Retrieved 2007-12-01. ^ Stanley (2008). "Predation defeats competition on the seafloor" (extract). Paleobiology. 34 (1): 1–21. doi:10.1666/07026.1. ^ a b c d e f g Butterfield, N. J. (2007). "Macroevolution and macroecology through deep time". Palaeontology. 50 (1): 41–55. doi:10.1111/j.1475-4983.2006.00613.x. ^ Condon, D.; Zhu, M.; Bowring, S.; Wang, W.; Yang, A. & Jin, Y. (1 April 2005). "U-Pb Ages from the Neoproterozoic Doushantuo Formation, China". Science (abstract). 308 (5718): 95–98. Bibcode:2005Sci...308...95C. doi:10.1126/science.1107765. PMID 15731406. ^ a b Xiao, S.; Zhang, Y.; Knoll, A. H. (January 1998). "Three-dimensional preservation of algae and animal embryos in a Neoproterozoic phosphorite". Nature. 391 (1): 553–558. Bibcode:1998Natur.391..553X. doi:10.1038/35318. ISSN 0090-9556. Hagadorn, James W.; Xiao, Shuhai; Donoghue, Philip C. J.; Bengtson, Stefan; Gostling, Neil J.; et al. (October 2006). "Cellular and Subcellular Structure of Neoproterozoic Animal Embryos". Science. 314 (5797): 291–294. Bibcode:2006Sci...314..291H. doi:10.1126/science.1133129. ISSN 0036-8075. PMID 17038620. Bailey, Jake V.; Joye, S. B.; Kalanetra, K. M.; Flood, B. E.; Corsetti, F. A. (January 2007). "Evidence of giant sulphur bacteria in Neoproterozoic phosphorites". Nature. 445 (7124): 198–201. Bibcode:2007Natur.445..198B. doi:10.1038/nature05457. ISSN 0028-0836. PMID 17183268. ^ a b Chen, J. Y.; Bottjer, D. J.; Oliveri, P.; Dornbos, S. Q.; Gao, F.; et al. (2004-07-09). "Small Bilaterian Fossils from 40 to 55 Million Years Before the Cambrian". Science. 305 (5681): 218–222. Bibcode:2004Sci...305..218C. doi:10.1126/science.1099213. PMID 15178752. ^ a b Bengtson, Stefan; Budd, G. (2004). "Comment on Small bilaterian fossils from 40 to 55 million years before the Cambrian". Science. 306 (5700): 1291a. doi:10.1126/science.1101338. PMID 15550644. ^ Philip, C. J.; Neil, J.; John, A.; Gostling, Neil J.; Huldtgren, Therese; et al. (August 2006). "Synchrotron X-ray tomographic microscopy of fossil embryos". Nature. 442 (7103): 680–3. Bibcode:2006Natur.442..680D. doi:10.1038/nature04890. ISSN 0028-0836. PMID 16900198. ^ Seilacher, A.; Bose, P.K. ; Pflüger, F. (1998). "Animals More Than 1 Billion Years Ago: Trace Fossil Evidence from India". Science (abstract). 282 (5386): 80–83. Bibcode:1998Sci...282...80S. doi:10.1126/science.282.5386.80. PMID 9756480. ^ a b Jensen, S. (2003). "The Proterozoic and Earliest Cambrian Trace Fossil Record; Patterns, Problems and Perspectives". Integrative and Comparative Biology (abstract). 43 (1): 219–228. doi:10.1093/icb/43.1.219. PMID 21680425. ^ Fedonkin, M.A. (1992). "Vendian faunas and the early evolution of Metazoa". In Lipps, J.; Signor, P. W. (eds.). Origin and early evolution of the Metazoa. New York: Springer. pp. 87–129. ISBN 978-0-306-44067-0. OCLC 231467647. Retrieved 2007-03-08. ^ a b Seilacher, Adolf; Luis A. Buatoisb; M. Gabriela Mángano (2005-10-07). "Trace fossils in the Ediacaran–Cambrian transition: Behavioral diversification, ecological turnover and environmental shift". Palaeogeography, Palaeoclimatology, Palaeoecology. 227 (4): 323–356. doi:10.1016/j.palaeo.2005.06.003. ^ Shen, B.; Dong, L.; Xiao, S.; Kowalewski, M. (January 2008). "The Avalon Explosion: Evolution of Ediacara Morphospace". Science (abstract). 319 (5859): 81–84. Bibcode:2008Sci...319...81S. doi:10.1126/science.1150279. PMID 18174439. ^ Grazhdankin (2004). "Patterns of distribution in the Ediacaran biotas: facies versus biogeography and evolution". Paleobiology. 30 (2): 203–221. doi:10.1666/0094-8373(2004)030<0203:PODITE>2.0.CO;2. ISSN 0094-8373. ^ a b Erwin, D.H. (June 1999). "The origin of bodyplans" (free full text). American Zoologist. 39 (3): 617–629. doi:10.1093/icb/39.3.617. ^ Seilacher, A. (1992). "Vendobionta and Psammocorallia: lost constructions of Precambrian evolution". Journal of the Geological Society, London (abstract). 149 (4): 607–613. Bibcode:1992JGSoc.149..607S. doi:10.1144/gsjgs.149.4.0607. Retrieved 2007-06-21. ^ a b Martin, M.W. ; Grazhdankin, D.V. ; Bowring, S.A.; Evans, D.A.D. ; Fedonkin, M.A. ; Kirschvink, J.L. (2000-05-05). "Age of Neoproterozoic Bilaterian Body and Trace Fossils, White Sea, Russia: Implications for Metazoan Evolution". Science (abstract). 288 (5467): 841–845. Bibcode:2000Sci...288..841M. doi:10.1126/science.288.5467.841. PMID 10797002. ^ Mooi, R.; Bruno, D. (1999). "Evolution within a bizarre phylum: Homologies of the first echinoderms" (PDF). American Zoologist. 38 (6): 965–974. doi:10.1093/icb/38.6.965. ^ McMenamin, M.A.S (2003). "Spriggina is a trilobitoid ecdysozoan". Abstracts with Programs (abstract). 35 (6): 105. ^ Lin, J. P.; Gon, S. M.; Gehling, J. G.; Babcock, L. E.; Zhao, Y. L.; Zhang, X. L.; Hu, S. X.; Yuan, J. L.; Yu, M. Y.; Peng, J. (2006). "A Parvancorina-like arthropod from the Cambrian of South China". Historical Biology. 18 (1): 33–45. doi:10.1080/08912960500508689. ^ a b c Butterfield, N.J. (December 2006). "Hooking some stem-group "worms": fossil lophotrochozoans in the Burgess Shale". BioEssays. 28 (12): 1161–6. doi:10.1002/bies.20507. ISSN 0265-9247. PMID 17120226. ^ Li, C.; Chen, J. Y.; Hua, T. E. (1998). "Precambrian Sponges with Cellular Structures". Science. 279 (5352): 879–882. Bibcode:1998Sci...279..879L. doi:10.1126/science.279.5352.879. PMID 9452391. ^ Yin, L.; Xiao, S.; Yuan, X. (2001). "New observations on spiculelike structures from Doushantuo phosphorites at Weng'an, Guizhou Province". Chinese Science Bulletin. 46 (21): 1828–1832. Bibcode:2001ChSBu..46.1828Y. doi:10.1007/BF02900561. ^ Gnilovskaya, M. B. (1996). "New saarinids from the Vendian of the Russian Platform". Dokl. Ross. Akad. Nauk. 348: 89–93. ^ Fedonkin, M. A. (2003). "The origin of the Metazoa in the light of the Proterozoic fossil record" (PDF). Paleontological Research. 7 (1): 9–41. doi:10.2517/prpsj.7.9. Archived from the original (PDF) on 2009-02-26. Retrieved 2009-11-16. ^ Andrey Yu. Zhuravlev; et al. (September 2009). "First finds of problematic Ediacaran fossil Gaojiashania in Siberia and its origin". Geological Magazine. 146 (5): 775–780. Bibcode:2009GeoM..146..775Z. doi:10.1017/S0016756809990185. ^ Hofmann, H.J. ; Mountjoy, E.W. (2001). "Namacalathus-Cloudina assemblage in Neoproterozoic Miette Group (Byng Formation), British Columbia: Canada's oldest shelly fossils". Geology. 29 (12): 1091–1094. Bibcode:2001Geo....29.1091H. doi:10.1130/0091-7613(2001)029<1091:NCAINM>2.0.CO;2. ISSN 0091-7613. ^ a b Grotzinger, J.P.; Watters, W.A. ; Knoll, A.H. (2000). "Calcified metazoans in thrombolite-stromatolite reefs of the terminal Proterozoic Nama Group, Namibia". Paleobiology. 26 (3): 334–359. doi:10.1666/0094-8373(2000)026<0334:CMITSR>2.0.CO;2. ISSN 0094-8373. ^ Hua, H.; Chen, Z.; Yuan, X.; Zhang, L.; Xiao, S. (2005). "Skeletogenesis and asexual reproduction in the earliest biomineralizing animal Cloudina". Geology. 33 (4): 277–280. Bibcode:2005Geo....33..277H. doi:10.1130/G21198.1. Retrieved 2007-04-24. ^ Miller, A.J. (2004). "A Revised Morphology of Cloudina with Ecological and Phylogenetic Implications" (PDF). Retrieved 2007-04-24. ^ Hua, H.; Pratt, B.R. ; Zhang, L.U.Y.I. (2003). "Borings in Cloudina Shells: Complex Predator-Prey Dynamics in the Terminal Neoproterozoic". PALAIOS. 18 (4–5): 454–459. Bibcode:2003Palai..18..454H. doi:10.1669/0883-1351(2003)018<0454:BICSCP>2.0.CO;2. ISSN 0883-1351. ^ Steiner, M.; Li, G.; Qian, Y.; Zhu, M.; Erdtmann, B. D. (2007). "Neoproterozoic to Early Cambrian small shelly fossil assemblages and a revised biostratigraphic correlation of the Yangtze Platform (China)". Palaeogeography, Palaeoclimatology, Palaeoecology. 254 (1–2): 67–99. doi:10.1016/j.palaeo.2007.03.046. ^ Rozanov AY, Khomentovsky VV, Shabanov YY, Karlova GA, Varlamov AI, Luchinina VA, Pegel' TV, Demidenko YE, Parkhaev PY, Korovnikov IV, Skorlotova NA, et al. (2008). "To the problem of stage subdivision of the Lower Cambrian". Stratigraphy and Geological Correlation. 16 (1): 1–19. Bibcode:2008SGC....16....1R. doi:10.1007/s11506-008-1001-3. ^ V. V. Khomentovsky; G. A. Karlova (2005). "The Tommotian Stage Base as the Cambrian Lower Boundary in Siberia". Stratigraphy and Geological Correlation. 13 (1): 21–34. ^ V. V. Khomentovsky; G. A. Karlova (2002). "The Boundary between Nemakit-Daldynian and Tommotian Stages (Vendian-Cambrian Systems) of Siberia". Stratigraphy and Geological Correlation. 10 (3): 13–34. ^ Ivantsov, A. Y. (2009). "A New Reconstruction of Kimberella, a Problematic Vendian Metazoan". Paleontological Journal. 43 (6): 601–611. doi:10.1134/S003103010906001X. ^ Porter, S. (2011). "The rise of predators". Geology. 39 (6): 607–608. Bibcode:2011Geo....39..607P. doi:10.1130/focus062011.1. ^ Cohen, P. A.; Schopf, J. W.; Butterfield, N. J.; Kudryavtsev, A. B.; MacDonald, F. A. (2011). "Phosphate biomineralization in mid-Neoproterozoic protists". Geology. 39 (6): 539–542. Bibcode:2011Geo....39..539C. doi:10.1130/G31833.1. ^ Kennedy, M. J.; Droser, M. L. (2011). "Early Cambrian metazoans in fluvial environments, evidence of the non-marine Cambrian radiation". Geology. 39 (6): 583–586. Bibcode:2011Geo....39..583K. doi:10.1130/G32002.1. ^ Matthews, S.C.; Missarzhevsky, V.V. (1975-06-01). "Small shelly fossils of late Precambrian and early Cambrian age: a review of recent work". Journal of the Geological Society. 131 (3): 289–303. Bibcode:1975JGSoc.131..289M. doi:10.1144/gsjgs.131.3.0289. ^ Lieberman, BS (March 1, 1999). "Testing the Darwinian Legacy of the Cambrian Radiation Using Trilobite Phylogeny and Biogeography". Journal of Paleontology (abstract). 73 (2): 176. doi:10.1017/S0022336000027700. ^ Dornbos, S.Q. ; Bottjer, D.J. (2000). "Evolutionary paleoecology of the earliest echinoderms: Helicoplacoids and the Cambrian substrate revolution". Geology. 28 (9): 839–842. Bibcode:2000Geo....28..839D. doi:10.1130/0091-7613(2000)28<839:EPOTEE>2.0.CO;2. ISSN 0091-7613. ^ Butterfield, Nicholas J. (2003). "Exceptional Fossil Preservation and the Cambrian Explosion". Integrative and Comparative Biology. 43 (1): 166–177. doi:10.1093/icb/43.1.166. PMID 21680421. ^ Conway Morris, Simon (2008). "A Redescription of a Rare Chordate, Metaspriggina Walcotti Simonetta and Insom, from the Burgess Shale (Middle Cambrian), British Columbia, Canada". Journal of Paleontology. 82 (2): 424–430. doi:10.1666/06-130.1. ^ Xiao, Shuhai; Steiner, M; Knoll, A. H; Knoll, Andrew H. (2002). "A Reassessment of the Neoproterozoic Miaohe Carbonaceous Biota in South China". Journal of Paleontology. 76 (2): 345–374. doi:10.1666/0022-3360(2002)076<0347:MCCIAT>2.0.CO;2. ISSN 0022-3360. ^ a b c Harvey, T.H; Butterfield, N.J (April 2008). "Sophisticated particle-feeding in a large Early Cambrian crustacean". Nature. 452 (7189): 868–71. Bibcode:2008Natur.452..868H. doi:10.1038/nature06724. ISSN 0028-0836. PMID 18337723. ^ Harvey, T.P.H. (2007). "The ecology and phylogeny of Cambrian pancrustaceans" (PDF). In Budd, G.E. ; Streng, M.; Daley, A.C.; Willman, S. (eds.). Programme with Abstracts. Palaeontological Association Annual Meeting. 51. Uppsala, Sweden. ^ a b Droser, Mary L; Finnegan, Seth (2003). "The Ordovician Radiation: A Follow-up to the Cambrian Explosion?". Integrative and Comparative Biology. 43 (1): 178–184. doi:10.1093/icb/43.1.178. PMID 21680422. ^ Paterson, John R.; Edgecombe, Gregory D.; Lee, Michael S. Y. (2019). "Trilobite evolutionary rates constrain the duration of the Cambrian explosion". Proceedings of the National Academy of Sciences. 116 (10): 4394–4399. doi:10.1073/pnas.1819366116. PMID 30782836. ^ Landing, E.; Kouchinsky, A. V. (2016). "Correlation of the Cambrian Evolutionary Radiation: geochronology, evolutionary stasis of earliest Cambrian (Terreneuvian) small shelly fossil (SSF) taxa, and chronostratigraphic significance". Geol. Mag. 153 (4): 750–756. Bibcode:2016GeoM..153..750L. doi:10.1017/s0016756815001089. ^ a b Budd, G.E. ; Jackson, I.S.C. (2016). "Ecological innovations in the Cambrian and the origins of the crown group phyla". Phil. Trans. R. Soc. B. 371 (1685): 20150287. doi:10.1098/rstb.2015.0287. PMC 4685591. PMID 26598735. ^ Xiao, Shuhai; Yuan, Xunlai; Knoll, Andrew H. (2000-12-05). "Eumetazoan fossils in terminal Proterozoic phosphorites?". Proceedings of the National Academy of Sciences of the United States of America. 97 (25): 13684–13689. Bibcode:2000PNAS...9713684X. doi:10.1073/pnas.250491697. PMC 17636. PMID 11095754. ^ Yin, Zongjun; Zhu, Maoyan; Davidson, Eric H.; Bottjer, David J.; Zhao, Fangchen; Tafforeau, Paul (2015-03-24). "Sponge grade body fossil with cellular resolution dating 60 Myr before the Cambrian". Proceedings of the National Academy of Sciences of the United States of America. 112 (12): E1453–E1460. Bibcode:2015PNAS..112E1453Y. doi:10.1073/pnas.1414577112. ISSN 0027-8424. PMC 4378401. PMID 25775601. ^ Taylor, P.D. ; Berning, B.; Wilson, M.A. (2013). "Reinterpretation of the Cambrian 'bryozoan' Pywackia as an octocoral". Journal of Paleontology. 87 (6): 984–990. doi:10.1666/13-029. ^ a b c Erwin, D.H.; Davidson, E.H. (July 1, 2002). "The last common bilaterian ancestor". Development. 129 (13): 3021–3032. PMID 12070079. Retrieved 2008-07-10. ^ Bengtson, S.; Zhao, Y. (17 July 1992). "Predatorial Borings in Late Precambrian Mineralized Exoskeletons". Science. 257 (5068): 367–9. Bibcode:1992Sci...257..367B. doi:10.1126/science.257.5068.367. PMID 17832833. ^ Chen, J.Y. ; Oliveri, P.; Davidson, E.; Bottjer, D.J. (2004). "Response to Comment on "Small Bilaterian Fossils from 40 to 55 Million Years Before the Cambrian"". Science. 306 (5700): 1291. doi:10.1126/science.1102328. ^ Lieberman, B. (2003). "Taking the Pulse of the Cambrian Radiation". Integrative and Comparative Biology. 43 (1): 229–237. doi:10.1093/icb/43.1.229. PMID 21680426. ^ Jacobs, D. K.; Wray, C. G.; Wedeen, C. J.; Kostriken, R.; Desalle, R.; Staton, J. L.; Gates, R. D.; Lindberg, D. R. (2000). "Molluscan engrailed expression, serial organization, and shell evolution". Evolution & Development. 2 (6): 340–347. doi:10.1046/j.1525-142x.2000.00077.x. PMID 11256378. ^ Erwin, D.H. (2007). "Disparity: Morphological Pattern And Developmental Context". Palaeontology. 50 (1): 57–73. doi:10.1111/j.1475-4983.2006.00614.x. ^ Stockmeyer Lofgren, Andrea; Plotnick, Roy E.; Wagner, Peter J. (2003). "Morphological diversity of Carboniferous arthropods and insights on disparity patterns through the Phanerozoic". Paleobiology. 29 (3): 349–368. doi:10.1666/0094-8373(2003)029<0349:MDOCAA>2.0.CO;2. ISSN 0094-8373. ^ Erwin, D. H. (2011). "Evolutionary uniformitarianism". Developmental Biology. 357 (1): 27–34. doi:10.1016/j.ydbio.2011.01.020. PMID 21276788. ^ Mounce, R. C. P.; Wills, M. A. (2011). "Phylogenetic position of Diania challenged" (PDF). Nature. 476 (E1): E1, discussion E3–4. Bibcode:2011Natur.476E...1M. doi:10.1038/nature10266. PMID 21833044. ^ McMenamin, M. (2010). "Harry Blackmore Whittington 1916–2010". Geoscientist. 20 (11): 5. Archived from the original on 2012-08-03. Retrieved 2011-08-12. ^ Budd, G. E.; Mann, R. P. (2018). "History is written by the victors: the effect of the push of the past on the fossil record" (PDF). Evolution. 72 (11): 2276–229. doi:10.1111/evo.13593. PMC 6282550. PMID 30257040. ^ Schirrmeister, B.E. ; deVos, J.M; Antonelli, A.; Bagherri, H.C. (2013). "Evolution of multicellularity coincided with increased diversification of cyanobacteria and the Great Oxidation Event". PNAS. 110 (5): 1791–1796. Bibcode:2013PNAS..110.1791S. doi:10.1073/pnas.1209927110. PMC 3562814. PMID 23319632. ^ a b Canfield, D.E. ; Poulton, S.W. ; Narbonne, G.M. (2007). "Late-Neoproterozoic Deep-Ocean Oxygenation and the Rise of Animal Life". Science. 315 (5808): 92–5. Bibcode:2007Sci...315...92C. doi:10.1126/science.1135013. PMID 17158290. ^ Bekker, A.; Holland, H.D. ; Wang, P.I. ; Rumble, III, D.; Stein, H.J. ; Hannah, J.L. ; Coetzee, L.L. ; Beukes, H.J. (2003). "Dating the rise of atmospheric oxygen". Nature. 427 (6970): 117–120. Bibcode:2004Natur.427..117B. doi:10.1038/nature02260. PMID 14712267. ^ a b c Parfrey, L.W. ; Lahr, D.J.G. ; Knoll, A.H.; Katz, L.A. (2011). "Estimating the timing of early eukaryotic diversification with multigene molecular clocks". PNAS. 108 (33): 13624–13629. Bibcode:2011PNAS..10813624P. doi:10.1073/pnas.1110633108. PMC 3158185. PMID 21810989. ^ Towe, K.M. (1970-04-01). "Oxygen-Collagen Priority and the Early Metazoan Fossil Record". Proceedings of the National Academy of Sciences (abstract). 65 (4): 781–788. Bibcode:1970PNAS...65..781T. doi:10.1073/pnas.65.4.781. PMC 282983. PMID 5266150. ^ Catling, D.C; Glein, C.R; Zahnle, K.J; McKay, C.P (June 2005). "Why O2 Is Required by Complex Life on Habitable Planets and the Concept of Planetary "Oxygenation Time"". Astrobiology. 5 (3): 415–438. Bibcode:2005AsBio...5..415C. doi:10.1089/ast.2005.5.415. ISSN 1531-1074. PMID 15941384. ^ Butterfield, N. J. (2009). "Oxygen, animals and oceanic ventilation: An alternative view". Geobiology. 7 (1): 1–7. doi:10.1111/j.1472-4669.2009.00188.x. PMID 19200141. ^ Keese, Bob. "Ozone". www.albany.edu. University at Albany. Retrieved 22 November 2014. ^ Hoffman, P.F. ; Kaufman, A.J. ; Halverson, G.P. & Schrag, D.P. (28 August 1998). "A Neoproterozoic Snowball Earth". Science (abstract). 281 (5381): 1342–1346. Bibcode:1998Sci...281.1342H. doi:10.1126/science.281.5381.1342. PMID 9721097. ^ Peters, S. E.; Gaines, R. R. (2012). "Formation of the 'Great Unconformity' as a trigger for the Cambrian explosion". Nature. 484 (7394): 363–366. Bibcode:2012Natur.484..363P. doi:10.1038/nature10969. PMID 22517163. ^ Squire, R. J.; Campbell, I. H.; Allen, C. M.; Wilson, C. J. (2006). "Did the Transgondwanan Supermountain trigger the explosive radiation of animals on Earth?" (PDF). Earth and Planetary Science Letters. 250 (1): 116–133. Bibcode:2006E&PSL.250..116S. doi:10.1016/j.epsl.2006.07.032. Retrieved 11 September 2017. ^ de Rosa, R.; Grenier, J.K.; Andreeva, T.; Cook, C.E. ; Adoutte, A.; Akam, M.; Carroll, S.B. ; Balavoine, G. (June 1999). "Hox genes in brachiopods and priapulids and protostome evolution". Nature. 399 (6738): 772–6. Bibcode:1999Natur.399..772D. doi:10.1038/21631. ISSN 0028-0836. PMID 10391241. ^ Newman, S.A.; Bhat, R. (April 2008). "Dynamical patterning modules: physico-genetic determinants of morphological development and evolution". Physical Biology. 5 (1): 0150580. Bibcode:2008PhBio...5a5008N. doi:10.1088/1478-3975/5/1/015008. ISSN 1478-3967. PMID 18403826. ^ Jackson, Daniel J.; Macis, Luciana; Reitner, Joachim; Wörheide, Gert (12 August 2011). "A horizontal gene transfer supported the evolution of an early metazoan biomineralization strategy". BMC Evolutionary Biology. 11: 238. doi:10.1186/1471-2148-11-238. PMC 3163562. PMID 21838889. ^ Parker, Andrew (2003). In the Blink of an Eye. Cambridge, Massachusetts: Perseus Books. ISBN 978-0-7382-0607-3. OCLC 52074044. ^ McCall (2006). "The Vendian (Ediacaran) in the geological record: Enigmas in geology's prelude to the Cambrian explosion". Earth-Science Reviews. 77 (1): 1–229. Bibcode:2006ESRv...77....1M. doi:10.1016/j.earscirev.2005.08.004. ^ Dawkins, R.; Krebs, R.J. (September 21, 1979). "Arms races between and within species". Proceedings of the Royal Society B. 205 (1161): 489–511. Bibcode:1979RSPSB.205..489D. doi:10.1098/rspb.1979.0081. JSTOR 77442. PMID 42057. ^ McMenamin, M. A. S. (1988). "Palaeocological feedback and the Vendian-Cambrian transition". Trends in Ecology and Evolution. 3 (8): 205–208. doi:10.1016/0169-5347(88)90008-0. PMID 21227202. ^ Zhang, Z.; Holmer, L. E.; Robson, S. P.; Hu, S.; Wang, X.; Wang, H. (2011). "First record of repaired durophagous shell damages in Early Cambrian lingulate brachiopods with preserved pedicles". Palaeogeography, Palaeoclimatology, Palaeoecology. 302 (3–4): 206–212. doi:10.1016/j.palaeo.2011.01.010. ^ a b López-Villalta, Julián Simón (2016). "Testing the Predation-Diversification Hypothesis for the Cambrian—Ordovician Radiation". Paleontological Research. 20 (4): 312–321. doi:10.2517/2016PR022. ISSN 1342-8144. ^ Peterson, K.J. ; McPeek, M.A. & Evans, D.A.D. (June 2005). "Tempo and mode of early animal evolution: inferences from rocks, Hox, and molecular clocks". Paleobiology (abstract). 31 (2 (Supplement)): 36–55. 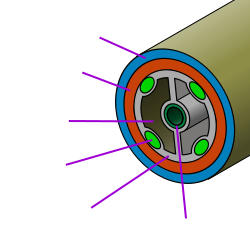 doi:10.1666/0094-8373(2005)031[0036:TAMOEA]2.0.CO;2. ISSN 0094-8373. ^ Erwin, D. H.; Tweedt, S. (2011). "Ecological drivers of the Ediacaran-Cambrian diversification of Metazoa". Evolutionary Ecology. 26 (2): 417–433. doi:10.1007/s10682-011-9505-7. ^ Solé, R.V. ; Fernández, P. & Kauffman, S.A. (2003). "Adaptive walks in a gene network model of morphogenesis: insights into the Cambrian explosion". Int. J. Dev. Biol. 47 (7): 685–693. arXiv:q-bio/0311013. Bibcode:2003q.bio....11013S. PMID 14756344. ^ a b Sperling, E.A. ; Frieder, C.A. ; Raman, A.V. ; Girguis, P.R. ; Levin, L.A.; Knoll, A.H. (2013). "Oxygen, ecology, and the Cambrian radiation of animals". PNAS. 110 (33): 13446–13451. Bibcode:2013PNAS..11013446S. doi:10.1073/pnas.1312778110. PMC 3746845. PMID 23898193. ^ Erwin, D.H.; Valentine, J.W. ; Sepkoski, J.J. (November 1987). "A Comparative Study of Diversification Events: The Early Paleozoic Versus the Mesozoic". Evolution. 41 (6): 1177–1186. doi:10.2307/2409086. JSTOR 2409086. PMID 11542112. ^ Valentine, J.W. (April 1995). "Why No New Phyla after the Cambrian? Genome and Ecospace Hypotheses Revisited". PALAIOS (abstract). 10 (2): 190–194. Bibcode:1995Palai..10..190V. doi:10.2307/3515182. JSTOR 3515182. Budd, G. E.; Jensen, J. (2000). "A critical reappraisal of the fossil record of the bilaterian phyla". Biological Reviews. 75 (2): 253–295. doi:10.1111/j.1469-185X.1999.tb00046.x. PMID 10881389. Conway Morris, S. (1997). The Crucible of Creation: the Burgess Shale and the rise of animals. Oxford University Press. ISBN 0-19-286202-2. Conway Morris, S. (June 2006). "Darwin's dilemma: the realities of the Cambrian 'explosion'". Philosophical Transactions of the Royal Society B: Biological Sciences. 361 (1470): 1069–1083. doi:10.1098/rstb.2006.1846. ISSN 0962-8436. PMC 1578734. PMID 16754615. An enjoyable account. Gould, S.J. (1989). Wonderful Life: The Burgess Shale and the Nature of History. W.W. Norton & Company. Kennedy, M.; M. Droser; L. Mayer. ; D. Pevear & D. Mrofka (2006). "Clay and Atmospheric Oxygen". Science. 311 (5766): 1341. doi:10.1126/science.311.5766.1341c. Knoll, A.H.; Carroll, S.B. (1999-06-25). "Early Animal Evolution: Emerging Views from Comparative Biology and Geology". Science. 284 (5423): 2129–37. doi:10.1126/science.284.5423.2129. PMID 10381872. Markov, Alexander V.; Korotayev, Andrey V. (2007). "Phanerozoic marine biodiversity follows a hyperbolic trend". Palaeoworld. 16 (4): 311–318. doi:10.1016/j.palwor.2007.01.002. Montenari, M.; Leppig, U. (2003). "The Acritarcha: their classification morphology, ultrastructure and palaeoecological/palaeogeographical distribution". Paläontologische Zeitschrift. 77: 173–194. doi:10.1007/bf03004567. Wang, D. Y.-C.; S. Kumar; S. B. Hedges (January 1999). "Divergence time estimates for the early history of animal phyla and the origin of plants, animals and fungi". Proceedings of the Royal Society B. 266 (1415): 163–71. doi:10.1098/rspb.1999.0617. ISSN 0962-8452. PMC 1689654. PMID 10097391. Xiao, S.; Y. Zhang & A. Knoll (January 1998). "Three-dimensional preservation of algae and animal embryos in a Neoproterozoic phosphorite". Nature. 391 (1): 553–58. Bibcode:1998Natur.391..553X. doi:10.1038/35318. ISSN 0090-9556. Martin, M.W; Grazhdankin, D.V; Bowring, S.A; Evans, D.A.D; Fedonkin, M.A; Kirschvink, J.L (2000). "Age of Neoproterozoic Bilaterian Body and Trace Fossils, White Sea, Russia: Implications for Metazoan Evolution". Science. 288 (5467): 841–845. Bibcode:2000Sci...288..841M. doi:10.1126/science.288.5467.841. PMID 10797002. Conway Morris, S. (April 2000). "The Cambrian "explosion": Slow-fuse or megatonnage?". Proceedings of the National Academy of Sciences. 97 (9): 4426–4429. Bibcode:2000PNAS...97.4426C. doi:10.1073/pnas.97.9.4426. PMC 34314. PMID 10781036.